Aviation Updates Philippines - Cebu Pacific got into trouble, after the airline's flight attendant was involved in an in-flight incident that led a child to have a first degree burn on her right arm while commencing in-flight service aboard flight 8974 on May 27. 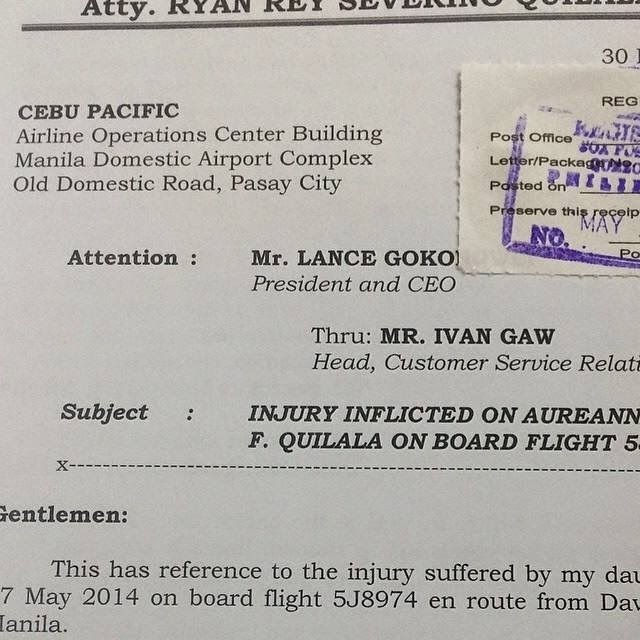 Ryan Quilala, a lawyer and the father of the six-year-old girl, told the Philippine Daily Inquirer that he will be filing a negligence case against the flight attendant. He also added that he will file a claim for damages against Cebu Pacific for the anxiety and trauma their family felt on board the flight on May 27. Cebu Pacific Air flight 8974 is an Airbus A330-300 service from Davao that was returning back to Manila. Quilala revealed that there were no first aid kits available that time. He also added that flight attendants did not undergo first aid training. The flight attendant, Quilala said, simply asked for forgiveness instead of immediately administering first aid treatment. Due to the pain caused by the steaming hot water, Reanne cried due to severe pain. However, flight attendants covered Reanne's right arm with a plastic bag full of ice. "Isn't it that first aid treatment for burns is running water? What she did is she took a plastic bag. Not an ice bag…but a plastic bag filled with ice. She applied it directly to my daughter’s arm." translated from Quilala's statement in Tagalog. He stopped the flight attendant because it was erroneous for her to do so. Instead, they used their own towel to wrap with ice. The World Health Organization said that ice should not be applied directly on burns because it deepens the injury. When Quilala asked for burn ointment, it took 20 minutes before it was handed. "The inscription on the burn ointment they gave us was in Deutsche. I asked them how will we know if it is indeed for burns. We had to check the box for the English translation. And it was only then that they checked if it was expired," Quilala said. Later, it was confirmed that the ointment had not yet expired. Such medication should always be ready in case of in-flight emergencies. However, a senior flight attendant told Quilala to write an email regarding the incident. But, after two days of waiting with no response, he decided to write a formal hand-written letter to Cebu Pacific's CEO, Lance Gokongwei. No media attention was wanted, but when a television network saw his post on a social networking site, he decided that he might as well tell the truth. A copy of the letter was also sent to the Civil Aeronautics Board and the Civil Aviation Authority of the Philippines. According to the Air Passengers Bill of Rights, the airline shall provide compensation for the affected passenger. On the domestic side, the compensation will be based on the stipulated amount in the relevant convention which governs international flight. On June 2 last year, a Cebu Pacific Air Airbus A320 flight to Davao overshot Runway 23 during heavy rain and low visibility. 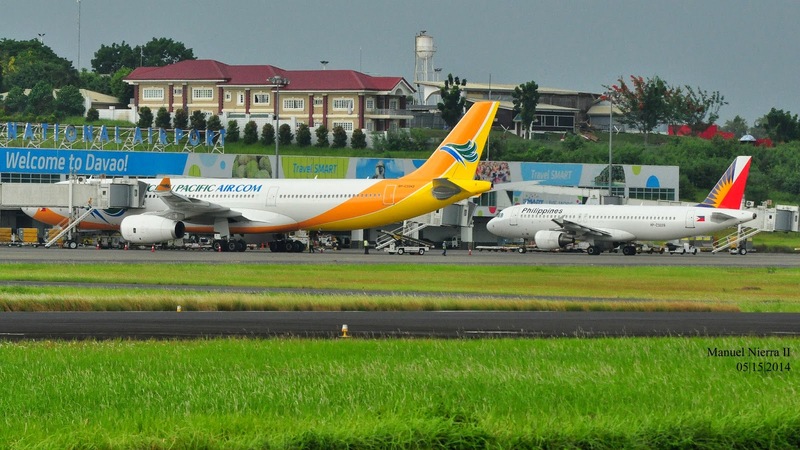 CAAP blamed the incident to the pilots stating that the landing should have aborted once the pilots had realized that they aren't lining up straight to the runway. However, the Davao Light & Power Co. admitted that during the aircraft's final approach, lights were out in some parts of the city. The Air Traffic Controllers said that runway lights weren't affected.